After proudly claiming he "has not struggled at all" with presiding over more executions (234) than any other modern governor, Rick Perry clearly is not going to quit while he's ahead. On Tuesday, Steve Woods became number 235, despite the fact that his co-defendant admitted to personally committing the capital crimes as part of a plea deal that spared his life. Duane Buck came within hours of being number 236 Thursday night, when the United States Supreme Court issued a stay to give the high court time to consider whether to review the claims Buck's counsel presented (including whether a defendant’s race may ever be used as a basis for the death penalty and whether the prosecution may rely on the defendant’s race as evidence that he would commit criminal acts of violence in the future). 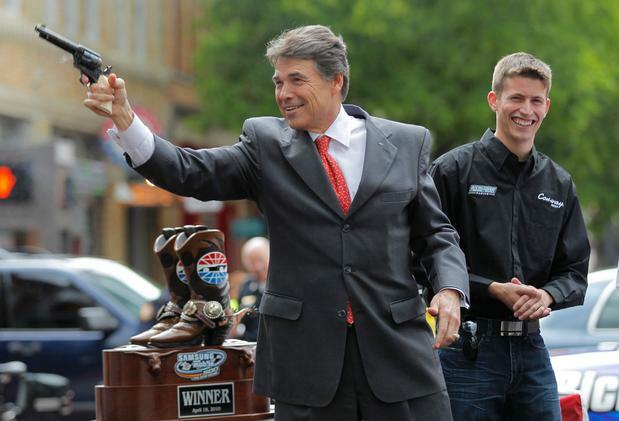 If it had been up to Governor Perry, Buck would be dead. Perry ignored a defense request for a 30-day reprieve, and was going to to let Buck's execution proceed despite the undisputed fact that his trial was tainted by racism. In fact, Perry was not even in the State. He was campaigning in Iowa, leaving any last minute decisions to his lieutenant governor. Let's think about that for a moment. Rick Perry was too busy running for president to even bother with the decision whether to grant a temporary reprieve to allow further consideration of the race-related issues in Duane Buck's trial. It is worth noting that it takes five Supreme Court justices to issue a stay. That means at least one, if not more, of the conservative justices on the court disagree with Perry's cavalier approach to the death penalty. And, given the majority's hostility to capital defendants, that is really saying something. Two more men are scheduled to be executed in Texas next week, including Cleve Foster who, like Steve Woods, was not the actual killer. We've already had a former Texas governor in the White House who gave remarkably short shrift to clemency decisions in death penalty cases. And we all know how that worked out. Chilling truths here, and you are right that it's all worth noting.